We just celebrated Independence Day and we all witnessed an abundance of red, white, and blue in both indoor, outdoor, and seasonal decor. 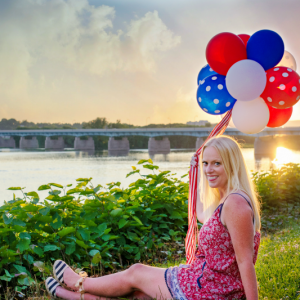 But I wonder why the fourth of July should have all of the fun? 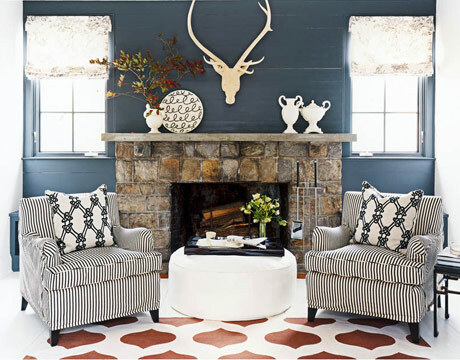 Today I want to share how red, white, and blue can look contemporary and sophisticated within your home year round. Let’s explore in detail some non-traditional ways to use these primary colors in home decor. I love that this little boy’s bedroom is traditional with a contemporary twist. The striped curtains, quilt, and brass bed provide the traditional framework for the room, while the stenciled wall, red painted bed, and dog silhouettes add a contemporary twist. 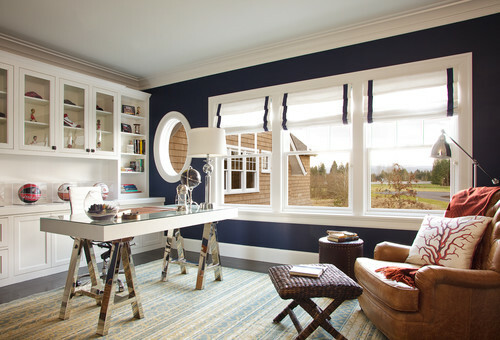 In this home office below, the blue accent wall takes center stage but is complimented with just a few small pops of red placed throughout the room. 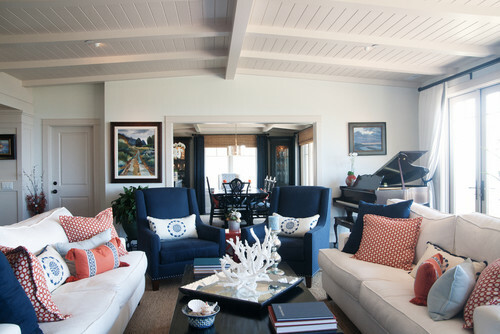 Tip: To add more vibrance to your blue and white spaces, consider using red accents throughout the room in the form of toss pillows, throws, fresh flowers, and small decor items. A little red goes a long way, so use sparingly, and don’t cluster too much color in one section of the room. In these next three photos, you can see how beautifully red, white, and blue work together in the kitchen! 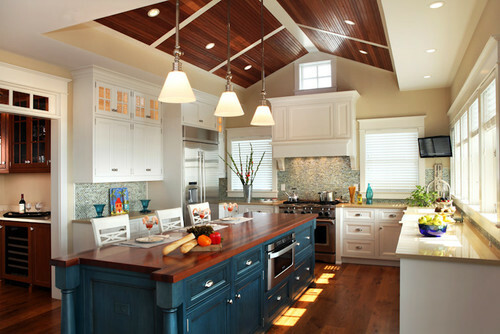 White kitchen cabinets are complimented by kitchen islands in unexpected shades of blue. Bold red accents are then brought into the rooms through accessories. This next grouping of photos is by far my favorite! The following living rooms combine a playful mix of geometrics, florals, and stripes which take patriotic to an entirely different level. The spaces look polished and sophisticated without looking fragmented or nautical. 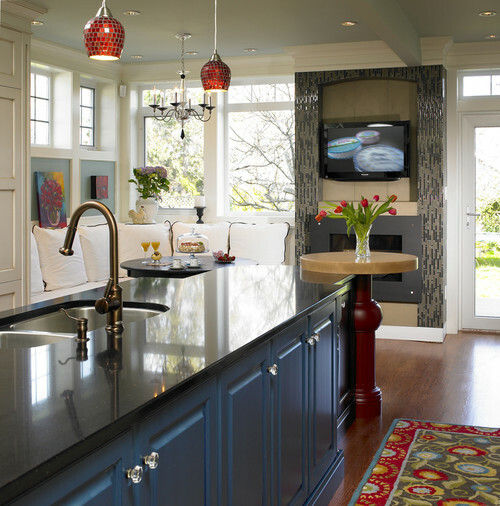 For a more traditional look, combine large scale florals with oriental rugs. I love the touch added by the red polka-dotted pillow and throw. Again we see here a mix of geometrics, stripes, and polkadots which create an eclectic mix of non-traditional nautical. Tip: If red isn’t your color, shades of coral or burnt orange are fantastic alternatives! 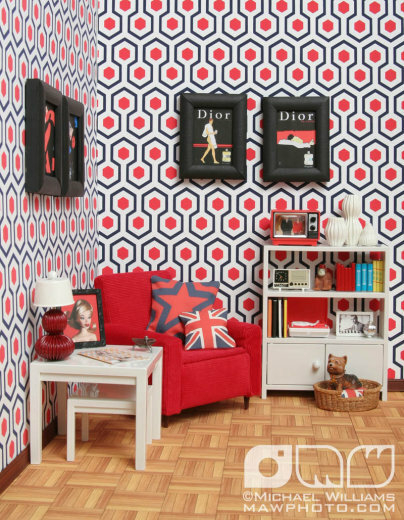 And to end on a humorous note, this Barbie living room is a lovely example of a modern take on red, white, and blue! The geometric wallpaper fits in perfectly with our theme. 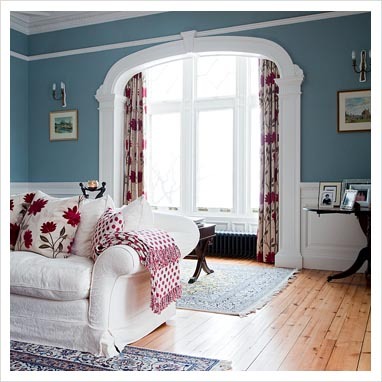 Whether you are more traditional, or contemporary in your home decor, patriotic colors might just be the right ones for you! I’d love to here which photo was your favorite and why? Tell me in the comments which one you were most drawn to. This post was written for Homes.com. 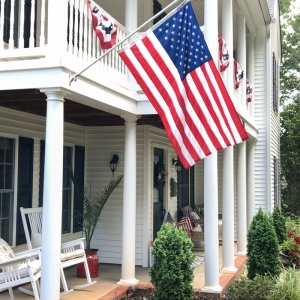 I have recently posted about our back porch that is done in red, white, and blue! I love it. Would I want it all over my house? Probably not. But that combo is crisp, clean, and beautiful. I love the rooms you featured! Great pictures-I am a sucker for red, white and blue! Notice the V placement of red objects in the 4th picture down? 🙂 I paid attention at Haven! I love the boy’s room from Playing Sublimely. Amy is a personal friend- so I was happy to see her beautiful “RW&B” design appear on your site today! How I love nautical -coastal! If I had to choose I LOVE the traditional kitchen with the red enamel stools. And the living room with the red leather chairs just makes my heart sing!! Thanks Beth, fantastic post!